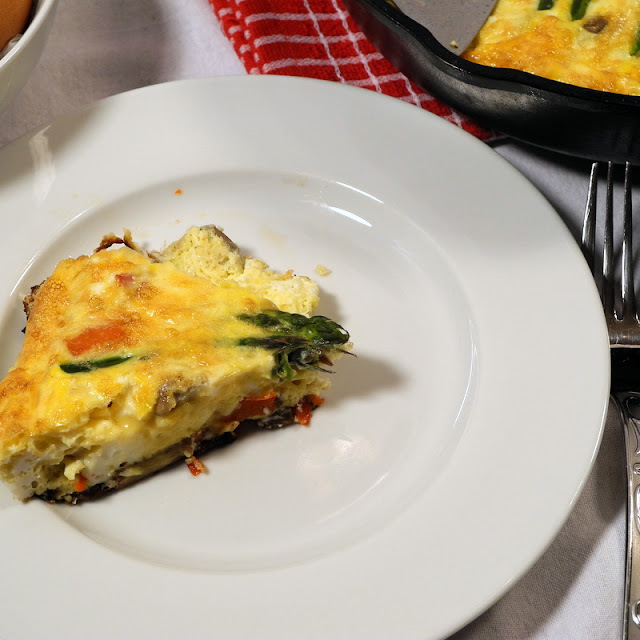 Nothing says spring like asparagus, so this weekend I made an asparagus frittata to post for Breakfast Ideas Mondays by Yummy Inspirations. If you need breakfast ideas, this is a great site to visit! For the frittata, I used half whole eggs and half egg whites to cut the fat a bit and you really couldn't tell that it wasn't made with all whole eggs. It does have some olive oil to saute some of the vegetables in, but you could probably steam them. And, I did use regular fat cheese, and you could use low fat if you want to cut the fat even more. This is really very quick and easy, and you could even cut up the vegetables the night before to make it even faster. And, it would make a great breakfast for dinner or brunch dish. We had it with biscuits and cantaloupe, but it would be tasty with any number of breakfast bread and fruit or even alone. Cut the asparagus in lengths about 4 inches long including the tips. You will probably have to cut off quite a bit. You can save the cut parts for another use or just eat them raw as a snack. Steam the asparagus until crisp-tender. Set the asparagus aside. In a large bowl, beat the eggs and stir the cheese into the eggs. Heat the olive oil in the a ten inch iron skillet. Saute the pepper, mushrooms, and garlic in the olive oil oil until soft and the liquid formed when cooking the vegetables begins to evaporate, so that there is very little liquid left in the pan. Spread the vegetables out evenly in the skillet. Pour the egg and cheese mixture over the vegetables. Arrange the asparagus decoratively in the eggs. 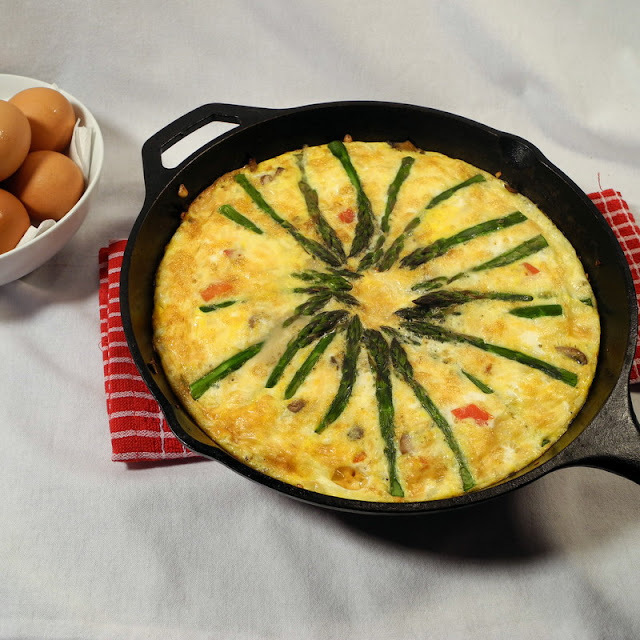 When the bottom of the frittata is set and it is beginning to cook around the edges, move the skillet to the oven and broil until the frittata is completely set and is beginning to brown slightly. Cut into wedges to serve. Simply gorgeous - a must make for me! Love frittatas for breakfast, lunch, or dinner!